Late summer 1941. Louisiana's piney woods are engulfed by a tidal wave of soldiers engaged in the largest army maneuvers ever undertaken on American soil. For many of these young men, as well as the isolated Southern communities, life will never be the same. Although no one knows it, our nation will be at war in three months. Elizabeth Reed is a young Louisiana schoolteacher who dislikes soldiers. Harry Miller is a Wisconsin soldier who hates Louisiana. It only makes sense that they should meet and fall in love. 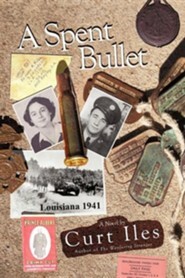 Their story begins with a bullet-an empty cartridge tossed from a truckload of soldiers. The note inside it will change the destinies of these two young people. In the midst of large-scale battles between the red and blue armies, Harry and Elizabeth are each fighting their own war with dark secrets from their pasts. They have nothing in common except mutual desires to escape these pasts. In spite of clashing at every turn, they run right into each other's arms as they jointly learn that the hardest person to forgive is yourself. Within this clash of cultures lies the core message of A Spent Bullet. Rural Louisiana is never the same, and neither are the soldiers who learn about Louisiana mud, mosquitoes, and misery mixed with memorable Southern hospitality. More than a love story, A Spent Bullet recreates a memorable but largely forgotten time in Louisiana and our nation's history. Told in the warm and touching style loved by readers of his previous eight books, Curt Iles weaves a story of love, history, and redemption. I'm the author/artist and I want to review A Spent Bullet: Louisiana 1941.